Wow, it’s been such a cloudy and rainy spring! 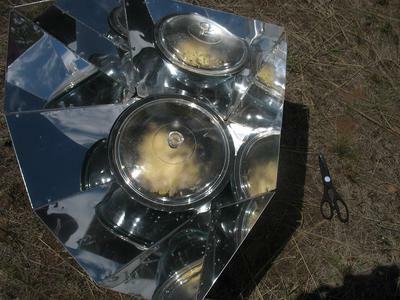 But, we’ve managed to do some solar cooking anyway, heating up leftovers and warming up (all natural) hot dogs. It’s been really nice, as we have no access to a microwave where we are frequently camping this year. Once I even broke the rules! I put in some frozen food, but only one serving of cooked mushrooms and cooked pasta, and only to reheat, not to cook. But the nice thing was, even with clouds, it was pleasantly warm in less than 2 hours (so no food safety issues). I can’t wait to get started “really” cooking in my Solar Hot Pots as soon as we see some more sun! We are getting more sun, now. Hope you are too! :) Just did some pizzas, kale chips, and chicken curry, and they turned out very yummy. Glad to see you back Christa, and your solar cookers! I know what you mean by too much cloudiness. We too (here in the desert southwest) have had an unusual amount of cloudiness. Not much rain though.